Alvord ISD board members named Dr. Randy Brown as superintendent of schools on August 14, 2015. Dr. Brown holds a Bachelor of Science degree from Eastern New Mexico University, a Master of Education degree from Texas A&M University -Commerce, and a Doctorate of Education in Education Leadership from Texas Tech University. Dr. Brown’s wife Andrea is a Registered Nurse with Bachelors and Master’s degrees from Texas Tech University. 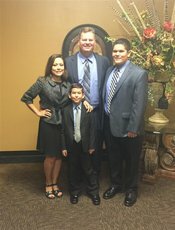 The Browns have two sons attending Alvord ISD, Zachary is in 9th grade and Jaxon is a second grader. Dr. Brown’s background includes experience in large and small, suburban and rural schools with diverse populations in various regions of the state. He has worked in elementary, junior high and high school settings and has experience as a substitute teacher, summer maintenance worker, bus driver, coach, teacher, assistant principal, principal, and superintendent. Quote from Dr. Brown - “We are thrilled to be in Alvord. The location and size of the school district and community are perfect for our family. Alvord ISD has a reputation of being a great school district with excellent teachers, students, and a supportive community. As superintendent my role is to serve as the lead learner of the district, allowing us to make better decisions together. My leadership style is collaborative with a focus on family and team building. Building on strengths, collaboration, communication, information, and time allow us to reach consensus and ownership through the decision making process. My goal is to meet, get to know, and listen to as many students, staff, parents, and community members as possible. We have some family history in Alvord and Wise County. My great great grandfather Henry Magers and his wife Lue Cindy moved from Arkansas to Alvord, Texas in 1886. She thought it was too cold in Arkansas and after wanting to move for a long time told him she was moving to Texas with or without him! He was a farmer and a school teacher in Alvord. Henry and Lue Cindy are buried here in the Alvord cemetery. Their daughter Cora (my great grandmother) married Thomas Pace (my great grandfather) in 1904 in a horse drawn buggy near Alvord. Cora and Thomas were both raised in Alvord. They were on their way to the preacher’s house when they passed him on the road and waved him down. He married them right there on the road. They moved back and forth between Oklahoma and Alvord, Texas several times. They moved in uncovered wagons and just hoped it wouldn't rain and they lived in tents before they could find a house or log cabin to live in. They eventually moved to Hockley County in 1925 after the boll weevils repeatedly ate their cotton in Alvord.